The Beneteau Oceanis Clipper 473 is a 47 foot monohull sailing yacht which is as for social, in harbour, sailing as it is for open water, all weather, sailing. The boat is fully fitted with extremely high quality amenities and has excellent sailing performance, coupled with exemplary cruising potential. Along with other new boats in the Oceanis range, the 473 has paved the way for new boats that dispell the myth that all Beneteau boats are 'restricted to enclosed water sailing only'. 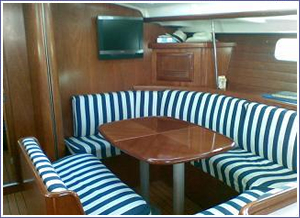 The boat is exsquisitly styled and is very well equiped as standard. Along with the 393, Beneteau have upgraded the new boats with deeper keels and bigger rigs. These upgrades have, largely, helped towards an exceptional sailing performance and ocean going capabilities. The main designer of the Clipper 473 was Jean Marie Finot of the French, boating design, company Groupe Finot. This, world renowned, company is responsible for some of the highest profile and unsurpassed boats in the mariner world. The Groupe Finot design has maximised the quality, look, feel and interior volume of the 473 making it a luxurious vessel with an excellent seakeeping quality in the open ocean.